Corstat Conductive stacking tote bins, designed and manufactured by GWP Conductive, are a flexible solution for in plant component handling and storage when ESD protection is required. 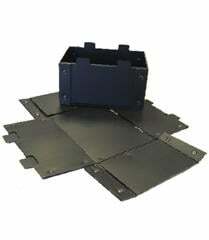 They are fabricated from Corstat conductive fibre board and are available from stock, in a range of standard sizes. They can also be customised through the addition of stock divisions designed to specifically suit your application. They offer a light weight, cost effective alternative to conventional injected moulded products, whilst still providing a high degree of static protection.